Miss Hartong writes about her second grade class, how they heard about Berry, and how they would like to help by sending their papers. 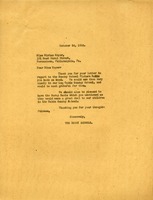 Letter offers to send what is most needed at Thanksgiving or Christmas and asks if Sunday school papers are still needed. 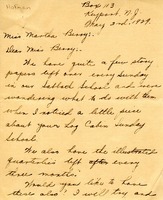 In this letter The Berry Schools tell Miriam Moyer that they could use the Sunday School Picture Rolls and scrap books she offered for their Log Cabin Sunday School. 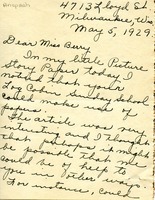 A letter from Miriam Moyer asking if the Log Cabin Sunday School could use the current year's beginner and primary Lesson Picture Rolls, as well as scrap books made by children. She would like to donate them if the school can use them.